Do you have any silhouette stamps? Have you ever needed one when you didn’t have one? 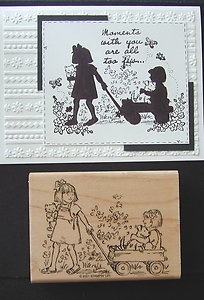 Well for this month, we are going to take a regular outline stamp and convert the image to a silhouette stamp. This is not difficult at all and will give you more opportunities to use that stamp than you ever thought possible. I believe I have that stamp but never ever thought to do that with the stamp. Doesn’t that look like fun? Well, naturally I had to test it out before asking you to do so. It was totally fun! Dig into your stamps and see if you can find one you’d like to turn into a silhouette and give this month’s Technique Challenge a try.